We refuse to use keys at our corporate rentals; keys are so 18th Century. But how else can your gardener get through a gate and into the backyard without keys? The YardLock is a great solution. 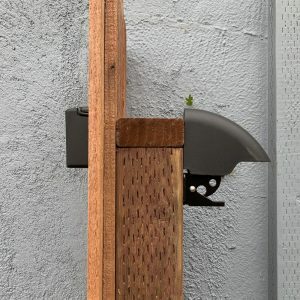 It’s a simple gate latch that has a box covering the pull wire. The box opens once your dial in the correct combination. Then the box pulls open the gate’s latch as it flops down. It’s a simple mechanical device that’s easy to use and looks great. The YardLock was easy enough to install but I did have to drill a larger hole to thread the pull wire though. That was disappointing. I suggest you try to thread the pull wire through the holes before installing the device. You man need to drill out the wire mount holes like I did. Besides that, I’m very please and recommend this elegant access management solution for an infrequently used gate. You can pick up the YardLock for around $50 (depending of if it’s new or used) on Amazon. Now when it comes to your rental’s side gate, there’s no reason to sacrifice security for ease of use. If you’re operating a short-term rental, you can use this device to control access to tool rooms, bonus equipment, or other accessories that you can monitize. Then you could simply text your client the code after they sent you additional money. With that in mind, I’m calling this device a potential money-making asset. How could you use the YardLock?